WWI | Rainbow Division Veterans Memorial Foundation, Inc.
On April 6, 1917, the United States Congress declared war on the German Empire and entered the Great War. In the rush to mobilize troops, individual states competed with each other for the honor to be the first to send their National Guard units into combat. Secretary of War Newton D. Baker authorized the organization of a Division made up of National Guard units from 26 different states and the District of Columbia. 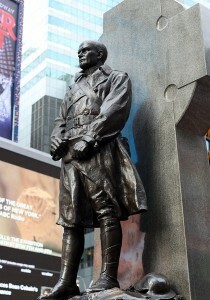 Douglas MacArthur, who at the time was a Major working at the office of the Secretary of War, is credited with saying “The 42nd Division stretches like a Rainbow from one end of America to the other.” MacArthur was instrumental in the formation of the Division and was appointed its Chief of Staff and promoted to Colonel. The 42nd (Rainbow) Division was activated in August 1917 and was assembled at Camp Mills in Long Island NY. Its four infantry regiments were respectively 165th (formerly New York’s 69th); 166th (formerly Ohio’s 4th); 167th (formerly Alabama’s 4th); and 168th (formerly Iowa’s 3rd). War strength of 27,000 was present when the Division paraded for Secretary of War Baker on September 26, 1917. The Division arrived in France in November and December of 1917 and trained in Eastern France until mid-February 1918. On February 27, 1918, the 165th (New York’s Fighting 69th re-designated as 165thwhen it became a part of the Rainbow Division) Regiment of the Rainbow Division arrived for duty in the trenches in the Rouge Bouquet sector. 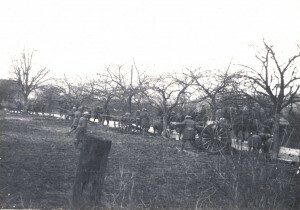 On March 7th at 3:20 pm, the enemy began an artillery barrage of the American trenches. One of the shells landed on the roof of a dugout in which 22 men were assembled. All 22 were buried under mud, dirt and beams. Two men were rescued and five bodies recovered. The voices of other survivors could be heard from the dugout. After hours of intense rescue efforts and under heavy enemy artillery fire, they finally had to give up any hope of reaching the remaining soldiers. The bodies of fifteen men still remained in the dugout, but recovery was impossible due to mudslides and enemy shelling. Later, the famous Fighting 69th Chaplain Father Duffy, conducted Last Rites and the men placed a tablet at the dugout. 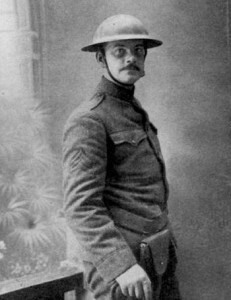 Joyce Kilmer, another famous member of the 69th, wrote the poem “Rouge Bouquet” to memorialize the men who died. The poem was read aloud by Father Duffy for the first time ten days after the sad event, on St. Patrick’s Day. Sergeant Patrick Stokes stood near Father Duffy and played “Taps” before the last lines of each verse. The notes were echoed by another bugle player who was stationed in the woods nearby. 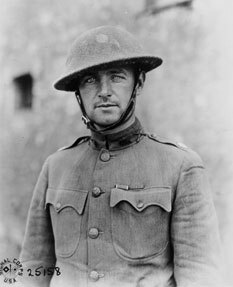 Major William “Wild Bill” Donovan, the Regimental Commander, was awarded the Croix de Guerre for his actions during the incident at Rouge Bouquet. In late June 1918 the Rainbow Division traveled by train to the Champagne-Marne region and became a part of the French Fourth Army, led by General Henri Gouraud. The French front in this area extended from the border of Reims eastward to the Argonne Forest, a distance of about 40 miles. With the objective of splitting the French Fourth and Sixth Armies the Germans launched what turned out to be their last offensive of the war on July 15, 1918. They committed 17 divisions to attack the French Sixth Army and 23 divisions to attack the French Fourth. Information about the attack had been leaked, however, and as a result the Allied forces knew the time that the attack would begin. General Gouraud was able to employ an elastic defense-in-depth strategy, where the majority of his forces were drawn back about a mile and a half from the front lines leaving only a series of strong detached points. At 4:20 am wave upon wave of German troops broke through to their first objective, the French-American front lines of the day before, but the trenches by then were deserted! While they hesitated, the Allied light artillery poured a deadly fire into the famous Prussian Guard. Seven times they attacked the front of the Rainbow infantry and the French divisions, but the wall remained impregnable. The German losses were enormous and their advance soon came to a standstill. The decisive Battle of Champagne ended with heavy casualties but with victory for the Allies. To this day the Foundation holds a memorial service called the Champagne Hour to commemorate this famous battle, and the sacrifices that have been made in all Rainbow action. The 42nd Infantry Division received the name “Rainbow Division” in 1917 during its organization at Camp Mills, Long Island, New York. The Chief of Staff of the Division at that time was Colonel Douglas MacArthur. As they were discussing the organization of the Division and reviewing the National Guard units from 26 states that would make up the Division, MacArthur commented that “The 42nd Division stretches like a Rainbow from one end of America to the other.” The comment caught the interest of those present and they decided to call it the “Rainbow Division”. After a few weeks of training had past, it was decided to create a patch for the Division, Local seamstresses in Hempstead were contacted and a Rainbow patch was created out of strips of felt on squares of brown wool uniform cloth. The three primary colors of the Rainbow; Red, Gold, and Blue were selected. 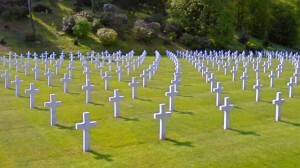 The soldiers immediately adopted the design. Since there was no method for the government to provide the patches, seamstresses on Long Island and later in France, were kept busy throughout the war sewing Rainbow Patches. The shoulder sleeve insignia was originally authorized by telegram on October 29, 1918, for the 42nd Division. Originally the shoulder patch was a complete half arc and contained thin bands in multiple colors. 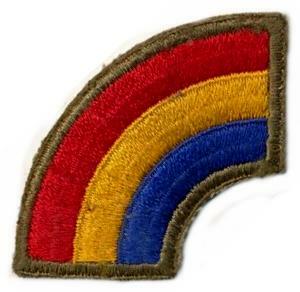 During the latter part of World War I and post war occupation duty in Germany, Rainbow Division soldiers modified the patch to a quarter arc, removing half the symbol to memorialize the half of the Division’s soldiers who became casualties (killed or wounded) during the war.